Making this charming hanging Christmas angel is easy to do. It requires very little supplies and can be done in an hour or so. We start out by making the arms and robe of the angel. Then add the adornments, the angel’s head and the ribbon on which the angel will hang on the Christmas tree. Cut the red or maroon cardboard into two parts. The one part should be one-third of the total size of the cardboard, with the other part being two-thirds. The smaller piece should be a little longer than half the length of the popsicle stick. Fold the smaller sheet of cardboard paper into several zigzags. The width of the zigzags can differ, but it is best to align it with the width of the popsicle stick. Hot glue one side of the folded paper to the popsicle stick. The inner end of the paper should be situated in the middle part of the popsicle stick. Stretch the free part of the zigzag cardboard and reach the other part of the popsicle stick. Hot glue the other free end of the zigzag cardboard to the popsicle stick. Fold the other piece of maroon paper into a zigzag. The width of the zigzags should be the same as that of the angel’s arms. Gather the ends of one side of the “robe paper” and hot glue it on the middle part of the popsicle stick where the”arms” were glued. Cut a small concave from the white or beige construction paper. Create some designs on the curved part of the concave. Hot glue the concave paper on top of the angel’s body. The linear part of the concave should be parallel to the popsicle stick of the angel’s body. Now we have the upper part body of the angel’s robe. 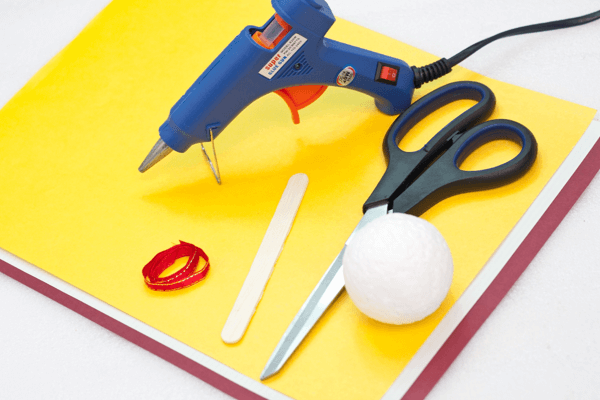 Hot glue the styrofoam ball on top of the popsicle stick to create the angel’s head. Cut a small star from the yellow construction paper and hot glue it onto the middle of the white or beige concave. Cut a small piece of red satin ribbon and glue the ends together and then generously glue it to the top of the angel’s head. Now decide where you want to hang your adorable Christmas angel. Why not make a dozen or so and hang them as a group on your tree. You can also buy A3 paper and make much bigger once and hang them on your porch. These angels are very economic and simple to make and will add joy and Christmas spirit to your home this festive season. So now that you know how to make a hanging Christmas angel, experiment… You can make any color angel. If you like the mint green Christmas ornaments that I showed on this page here, then why not make the wings and robe of the angel mint green?